To be one of my trusted recipe source, I expect the recipe to be well-written and clear. There are some people who I respect, and yet, their recipes are hard to follow because they leave too much open to interpretation. As a home cook, I find this frustrating. Just tell me how much sugar to add! I also expect my trusted sources to write recipes that actually turn out the way they say they will. This may seem obvious, but a relationship of trust is built on the idea that you tell me this cake will be moist, and then I expect the cake to be moist. If you don't hold up your end of the bargain, I have trouble trusting you as a source, regardless of how beautiful the photograph is or how catchy the title may be. As an added bonus, most of my trusted recipe sources are inspirational and creative. This means they push the envelope, go above and beyond, and make something have that wow factor that sets the finished dish apart from other versions. 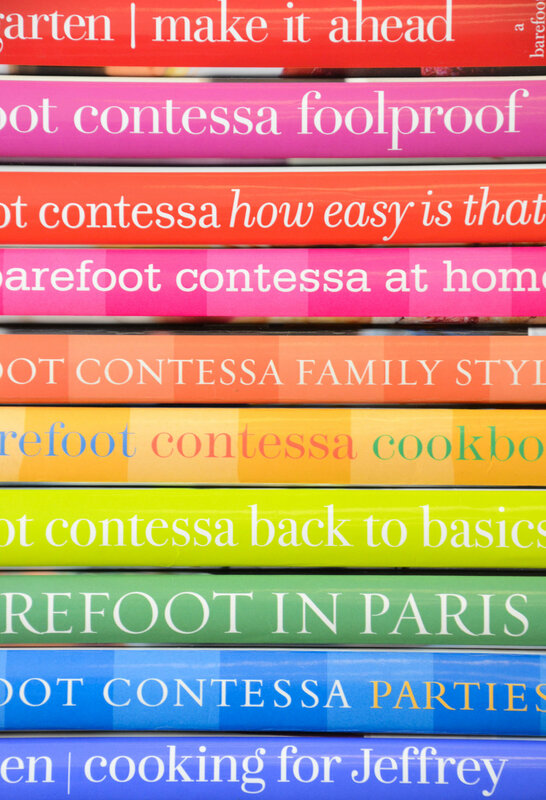 If I had to use only one source for the rest of my days, it would be all the Barefoot Contessa cookbooks, by Ina Garten. She taught me everything I know in the kitchen. Ina is my first love in the trusted recipe department. I owe her a debt of gratitude, and I wish she could know how she impacted my life...maybe one day I will get to tell her in person. Ina's cookbooks were the first to make me long for a reason and occasion to prepare the beautiful food I saw on the pages of her cookbooks. Her show inspired me on a deep soulful level. I would sit and watch her for hours, learning everything I could, listening to her philosophy on making things ahead, keeping things simple, and always striving to make everyone feel comfortable. Everything I have made from her cookbooks always turns out. She tells me exactly how much salt to add, how long to mix a batter, and her photos are accurate representations of the finished dish. Her recipes are expertly written, simple to follow, and always yield delicious results. Gold medal, Ina!! Second in my heart is the Bon Appetit magazine and bonappetit.com. This publication has showed up in my mailbox every month for almost two decades. They have gone through a few "off" seasons where they may have been trying too hard to recreate things, but for the most part, this magazine nails it. My first recipe collection was built mostly from torn out pages of the 1999 issues. And this past Thanksgiving, this magazine provided so much inspiration for my menu. I made their Dry Brined Turkey, Mashed Potatoes, Roasted Pork Shoulder, and the best dinner rolls I have ever tasted...all of it came from the November 2017 issue. I love their online resource because all of their recipes are archived, and I like being able to read the comments from people who have cooked the recipe before. One more fun tidbit about BA (as we call it). They have a really fun, excellent podcast called The Bon Appetit Foodcast. Highly recommend. The bronze medal goes to Rebecca Rather, who used to own a little bakery cafe in Fredricksburg, Texas called The Rather Sweet Bakery. She published three cookbooks, and her first one is my favorite. Her desserts are insanely delicious, and she does an excellent job of being clear in her instruction and unapologetic when certain things taking some extra work to yield quality results. I was gifted this cookbook by a dear friend, and was wowed right off the bat. My Tuxedo Cake, Bacon Cheddar Scones, Peach Cobbler, and Tortilla Soup came from this book. She has impacted my personal cooking repertoire on a grand scale. Two other sources that are worth mentioning are Martha Stewart and Cook's Illustrated. Martha is our generation's Julia Child. She is a classic. She redefined a genre for the home cook. She is always tasteful, and she sets a high bar for excellence. Martha knows what she's doing. I use her as a resource when I am researching sources or looking for the "old school" way of doing something. She also gave me my recipe for Chocolate Chip Cookies, and that is no small thing. I love her confidence and have so much respect for her as a business owner. Cook's Illustrated used to be my world. Everything they publish is based on scientific testing, and I love science so much. This publication educated me on the whys behind cooking and baking. They are the gold standard when it comes to expertly written recipes. I still use them as a learning resource, but their recipes are not the ones I turn to time and time again. Not because they don't turn out (they always do!!! ), but honestly because I want a recipe to have some heart to it, and they are by design free of emotion. If you are looking for a way to learn and improve as a cook, start reading the magazine cover to cover. There you have it! My top five trusted recipe sources. Who are yours?